LAS VEGAS — Microsoft detailed plans for XBox 360 enhancements, a new gesture-driven interface for the XBox and a tablet-style Windows PC tonight at a keynote presentation kicking off the Consumer Electronics Show here. It was the second year as CES headliner for Microsoft CEO Steve Ballmer, who took over the keynote spot from his former boss, Bill Gates, last year. 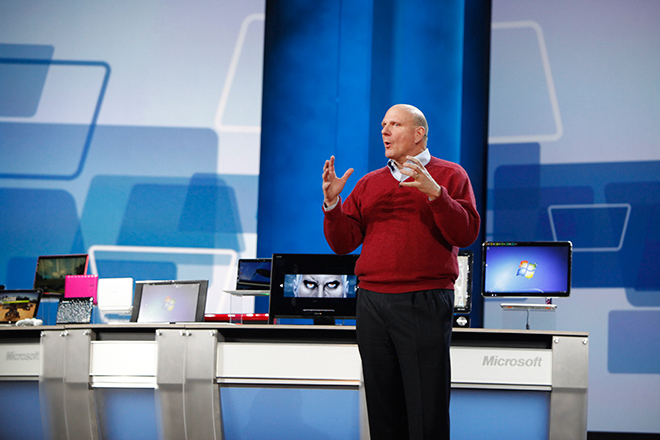 After a power outage briefly plunged the stage into darkness and delayed the start of the keynote by over 20 minutes, Ballmer ambled onstage in his trademark V-neck sweater. He touted the company’s successes with its recent Windows 7 launch, outlined its plans for enhancing home entertainment and tying together the “three screens” through which people experience media today (television, PC and mobile devices). He provided more details on upcoming enhancements to the successful XBox 360 platform and XBox Live online service. “From the largest screen on the wall to the smallest screens in people’s pockets, we are delivering the entertainment people want,” Ballmer said. View the Microsoft keynote live, via a video stream provided by the company. It’s been a good year for Microsoft. Ballmer reprised the launch of the company’s search engine, Bing, which he said has attracted 11 million users since its launch. There are now more than 39 million Xboxes in use around the world, and XBox game sales have totaled $20 billion since the platform’s launch, Ballmer said. And, Ballmer said, “the Zune HD device is getting rave reviews.” That is true — Wired’s review of the Zune HD is quite positive — but the device still has a single-digit share of the portable media player market. But the centerpiece of Microsoft’s business in 2009 was Windows 7. After taking well-deserved criticism for its launch of Windows Vista in 2007, Microsoft bounced back with many much-needed enhancements in Windows 7. For the most part, the critical and consumer response to Windows 7 has been excellent. The operating system is more streamlined, easier to use and prettier to look at than Vista, and it seems to have injected new life into what seemed like a staggering personal-computing dinosaur. Ballmer called Windows 7 the fastest-selling computer operating system in history, and touted figures showing that it drove a 50 percent increase in PC sales the week it was launched, and a 50 percent year-over-year increase in overall sales of Windows PCs. The Mac, it seems, has not killed off Windows. But with rumors of an upcoming Apple tablet looming large in many observers’ minds this week, Microsoft — along with many other computer industry companies — can’t afford to ignore the persistent irritation that is Apple. Accordingly, one of the gadgets shown by Microsoft tonight was a tablet-like device, produced by HP and running Windows 7. Not the “Courier” tablet that Microsoft previewed in 2009, this is more akin to old-school Tablet PCs, albeit with no keyboard and running the now-multitouch-enhanced Windows 7. HP said the device would be available later this year, but provided no details on pricing, availability or specifications. Another not-so-subtle message from Ballmer’s keynote: Apple’s iPhone hasn’t killed off Windows Mobile, either. Microsoft partners shipped 80 different Windows Mobile-based phones last year, Ballmer said, and indicated that more would be coming in 2010. As an example, he showed off the HTC HD-2, a new WinMo-powered phone that will be available on T-Mobile. The HD-2 will feature a 4.3-inch LCD screen and will be about as thick as two poker chips. Microsoft pushed the message that it’s an entertainment company, too, on two fronts. One was the announcement of Media Room 2.0, software for viewing multimedia content (videos, audio and photos) on your computer. The new version lets you view content on any screen in your home, from a phone to a PC to a TV, Ballmer said. And the second entertainment front is the XBox 360. Microsoft entertainment and devices division president Robbie Bach took the stage to show off the company’s achievements here. Fresh from the wildly successful pre-holiday launch of Modern Warfare 2 (one of the highest-grossing videogames in history, according to Microsoft), the company promised more games exclusive to the XBox platform to come in 2010, including Tom Clancy Splinter Cell, Crackdown 2, Mass Effect 2, Fable 3 and Alan Wake. An update to the Halo series, Halo Reach, will enter beta testing later this year. In an unusual twist, anyone who bought the previous title, Halo ODST, will be invited to take part in the Halo Reach beta test, which Microsoft anticipates will include as many as 2 million testers. Microsoft also showed off a new XBox Live feature called GameRoom, featuring more than 1,000 old arcade games from the likes of Atari and Intellivision, like Tempest and Pac-Man. Users will be able to create “virtual game rooms” that their XBox Live avatars (and those of their friends) can walk around in. Virtual quarters, one assumes, will be available without limit. Finally, Bach showed off the company’s gestural interface for XBox 360, Project Natal, which first appeared at E3 last year. Natal will be available in time for the holiday season in 2010, Bach promised, as a camera plus software that will work on all existing XBox 360 systems. Developers are currently working on Natal-enhanced games and applications that will be available when the system launches. Microsoft Touts Home Entertainment at CES Keynote | Gadget Lab | Wired.com.